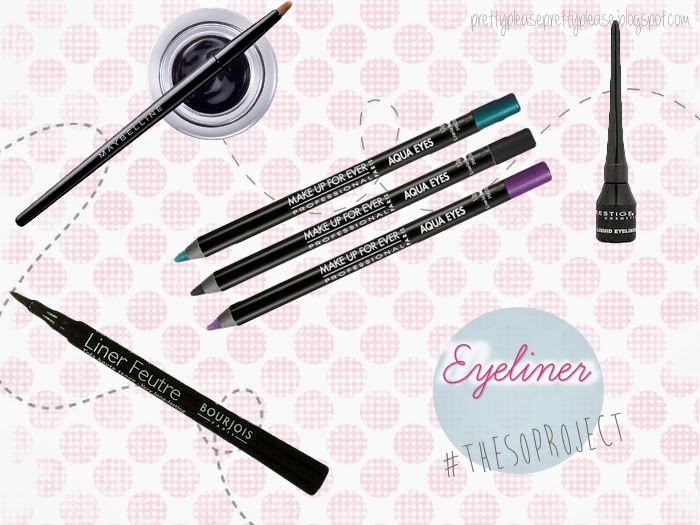 It's now week seven of #theSOproject, which means that we're talking about eyeliners! I know that for a lot of you this is a must-have member of your makeup collection, so it should be really interesting to hear everyone talk about it. For me eyeliner is a lovely product, but I only tend to wear it when I'm going for a full-face of makeup which I usually only do when I'm going somewhere nice or going out. I do love my liner and the way it can totally change the appearance of the eye. There are so many things that you can do with it that would really need more than one post to explore and explain how to do, so my tips today may seem a little vague at times but as always I am totally open to any questions and requests! Liquid - Adored by thirteen-year-old girls everywhere, the liquid liner can be the trickiest to apply. They usually come in a little bottle with a tapered applicator which you use directly on the eye. It can give a gorgeous 'glossy' look, and has a moderate staying-power but is very easy to smudge while it is drying! Gel - This comes in a little pot and is applied using a separate brush. The staying power of this stuff is fantastic, and because you can choose your brush you can have a lot more control as you apply it. I would definitely choose this if you wanted to try some more graphic/geometric liner looks. Pencil - This is what most people start out with, and I love this for the lower lash-line/waterline but I rarely use it on the upper lash line. This is just because I find that it looks a lot more smudgy and I prefer a clear-cut line on my top lashes. Pen - This is pretty much a liquid liner, but it comes in packaging that very much resembles a felt tip pen. In fact pretty much everything about the liner resembles a pen, right down to the way you hold it and the nib with which you apply it. This is perfect for beginners and great for if you're in a rush. Powder - Not many people really class this as a true liner, but when it comes to creating definition it's so useful, because when teamed with the right brushes your liner collection is as big as your eyeshadow collection! I use an angled liner brush for this, and often use it in the inner corner of my eye where it can be trickier to apply gel or liquid liner. As well as there being many types of eyeliner, there's also more than one way to wear it. I remember when I was at school the 'thick-black-lined-waterline' look was very in. The waterline is the fleshy part of your lower lash line, and putting liner on this part of the eye can help to make your eye makeup look more dramatic, although if you don't balance it out with some liner on your upper lash line it can look a bit unbalanced. Personally I love to wear a bit of gold liner here! Wearing this sort of liner is better done with pencil or gel rather than liquid. You can take the risk, but if you're not skilled you might end up with black all over your eyeball and being in a lot of pain. I may or may not be speaking from experience. One of the most commonly used techniques with eyeliner is lining the upper lash line. Not only does this make your lashes appear thicker, but you can also create some cool flicks and shapes! A how-to on this would require a full post, but if you're into getting a little funky with your liner then I have a colourful winged liner tutorial which has some tips on lining in general and getting the flick just right. The best thing to do is to remember to do your liner in lots of little lines rather than one big one. Practice really does make perfect with this, so set aside an hour with your liner and Bioderma and just try it! There are also some 'alternate' ways of wearing your liner which aren't necessarily weird like the wording may suggest, but they create different effects from your traditional liner. As mentioned earlier, one of these methods is by using an off-white or fleshy-coloured liner on your waterline to create the illusion of bigger or more awake eyes. This is a brilliant trick for when you're a little hungover! Coloured liners can also shake up your look and, depending on how they're worn, can range from super subtle to bright and fun. I love to smudge a little turquoise liner on my lower lash line for a pop of colour every now and then! Bourjois Liner Feutre - This is one of those fantastic liner pens that I told you about. This was one of the very first liners that I owned and I still repurchase it to this day; the nib is pretty good and it's generally a superb product if you're in a rush or a little heavy-handed on the liner application. My only criticism would be that the nib could be a little more precise at times. Bourjois 'Noir & Blanc' Eyeliner Pencil - I first got this pencil because it was a cheap way of getting both a black and white pencil in one (it's double-ended) and the quality was pretty good, too. Definitely not top notch as it will smudge a little, but I think that as a rule Bourjois is very good value for money. Clinique Kohl Shaper for Eyes - I'm usually a big fan of Clinique products, however this was thoroughly disappointing. The pencil didn't sharpen all that well and so application wasn't that precise and it smudged terribly! Perhaps it could just be the colour that I had (Blackened Pewter) but I honestly couldn't even wear it. The only thing I like it for is the handy eye pencil sharpener that it comes with on its lid. Clinique Quickliner for Eyes - This had a much better staying power than the Kohl, but I found that it was a little difficult to get the colour to rub off the pencil at times (perhaps I kept them for a little too long?! Don't judge!). These come in a variety of bright colours with no shimmer, though, which I really liked trying out when I had a couple of these. There's also a smudger on the other end for correcting mistake and creating a 'smokey' look. Mac Fluidline - This was the first gel liner that I purchased. I got a black with gold flecks called 'Blitz and Glitz' and while it is very good, I've recently found it to be a little bit cakey. This can only be expected when you've had a product a while, but I'm going to stick to my Maybelline gel liner from now on I think. Mac Kohl Pencil - I have this in two colours; Teddy (a shimmery mid-toned brown) and Fascinating (a bright white). Both are brilliant everyday colours, the pay off is very good and they don't irritate my eyes at all. Plus they've lasted me a pretty long time which is always nice when you pay a little more for a product. Mac Liquid Eye Liner - This is the only black liquid eyeliner that I've tried, but I really like it. Sometimes I feel like the rubber applicator drags a little too much product across the eye so it's not as opaque as I would like, but that may just be the way I apply it. I love this for more dramatic looks, especially when I'm flicking my liner, and I would definitely repurchase. Makeup Forever Aqua Eyes Pencil - I love these. If you need proof, I have a whole post on them here. My favourite shade is the gold as it can be both subtle or dramatic depending on how you wear it. These are great as they can be worn on any part of the eye (even as an eyeshadow base) and last for absolutely ages because they are waterproof. They are pretty pricey, but definitely worth it! Maybelline Eye Studio Gel Liner - This may be the best eyelining bargain you'll be able to find in Boots. Not only is it easy to apply, but it's just about as opaque and black as you will get for this sort of money and it lasts fantastically. Unfortunately I've lost mine, but for only £8 I know that I'll be reinvesting very soon! Prestige Liquid Eyeliner - This was a gift from a friend when I'd never tried liquid liner. I have this in a gunmetal silver shade which I like as it's pretty different. I haven't worn this in a while, but I actually really like it. 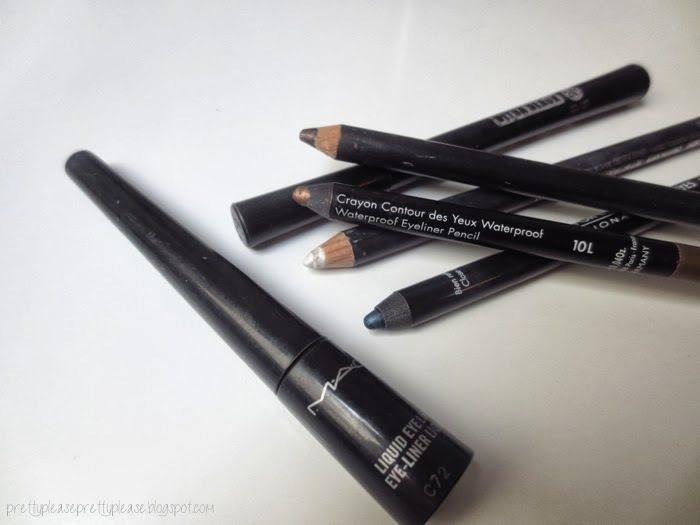 The applicator is comparable to the Mac one, and the colour pay-off is really good! It does take a while to dry, though. Smashbox Limitless Eye Liner - I got this in a little pack of Sephora's best sellers, and while it's a good pencil liner I'm not sure that I would say it's a game-changer. The pay-off is great, and maybe it's perfect if you're really into pencil liners. I feel like it's difficult for me to review this fairly as I don't get that excited about pencil liners, but it's definitely very black and is very difficult to smudge with great staying power! 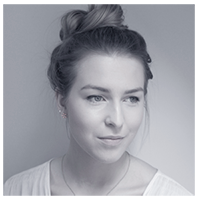 I hope that today's post may have opened your eyes a little to the world of eyeliner, and perhaps even inspired you to try something new if you're somewhat of an eyeliner-phobe! What type of eyeliner do you like to use?